FieldView in Summerville, SC might be an ideal spot to build a beautiful home for a price that is equally lovely. Situated near the historic district of Summerville, convenient shopping and some of the state's best schools, FieldView epitomizes all that buyers could wish for in a home. Set among green space, brightly-colored flowers and picket fences, these well-built homes offer a variety of very livable floor plans. "FieldView offers a custom home at a non-custom price," says Kimberly Byrd, sales and marketing manager for Manorhouse Builders. Prices for the craftsman-style homes in FieldView range from the mid-$200s to the mid-$300s, a surprisingly affordable price for the quality. The list of special features is lengthy and includes extras such as 10-foot smooth ceilings on the first floors, 9-foot smooth ceilings on the second floors and distinctive trim packages with wainscoting in dining rooms and foyers. "The workmanship and quality inside and out carry more weight than people have come to expect," says Peggy Murray, the new homes group coordinator for Prudential Southern Coast Real Estate. "And the style evokes the charm of the Charleston cottage, with vibrant colors, painted blue ceilings and porches." The homes are spacious, ranging in size from a little more than 1,600 square feet up to about 3,000 square feet, allowing plenty of room for growing families. There are three- and four-bedroom plans available; smaller floor plans include two-and-a-half bathrooms, while larger models have three or three-and-a-half baths. Whimsically named for flowers � Summerville is the Flowertown in the Pines, after all � there are nine plans from which to choose. Each home includes extras such as fiber cement siding, 30-year architectural shingles and a professionally landscaped, sodded yard with an irrigation system. A two-car concrete parking pad is part of the package, but there are options for adding a garage or carport. The homes are special inside, as well. Master bedroom suites occupy the first floor. Some floor plans offer breakfast nooks, studies, libraries, sunrooms, playrooms or even a "flex" room. And true to the South, all homes feature plenty of porches. "It's a front porch community," Byrd says, adding that winding sidewalks, ponds and a gazebo help contribute to the neighborly feel. Murray agrees, saying "It's so peaceful. You can sit on the porch in an old-style rocker and just enjoy the beauty." Kitchens are designed both for looks and functionality, with Corian countertops, maple cabinetry with crown molding and a stainless-steel appliance package that includes a dishwasher and a built-in microwave. "The homes were designed by Eric Moser of the Moser Design Group," Byrd says. "And they're very artistic yet very functional." The Moser Design Group is based in Beaufort, S.C., and is a major proponent of new urbanism and traditional neighborhood developments. The company's work is evident in neighborhoods such as I'On in Mount Pleasant, Habersham in Beaufort and Palmetto Bluff. 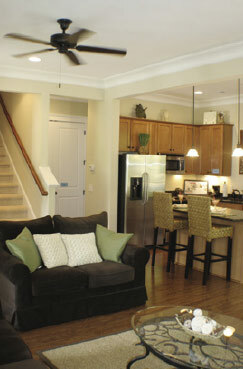 Manorhouse Builders of SC has been building town homes and single-family homes in the state since 2003. 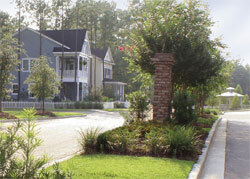 A division of Manor House Builders in Maryland, the company's projects include Town house communities in Mount Pleasant and James Island, as well as Ashley Park, which is located near West Ashley High School. FieldView represents Manorhouse's first single-family detached homes in a neo-traditional neighborhood. One of the great advantages of FieldView's location is its proximity to Gahagan Plantation Community Park, which includes a sports complex, and its nearness to downtown Summerville. "You can walk or bike to Main Street and Azalea Park," Murray says. "Or you can enjoy the walking trails or nearby ball fields." Byrd and Murray agree that FieldView offers all the advantages of living in an old-fashioned neighborhood near historic homes framed by the flowers and pine trees of Summerville.